Nope, no sir, not today. Not even the foot is listening. PS: Rick says, "This is Acorn, the "flopticated bunny". The first time he did this we thought he had died. Now he does it all of the time. 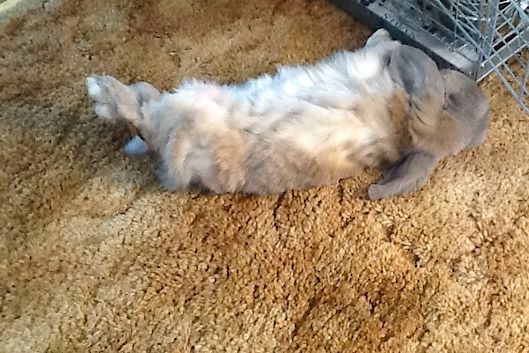 We've never had a rabbit who would sleep on his back with his feet n the air." Looks like he got kind of fluffed up by the vacuum sweeper! In that dream Acorn may never have noticed. At least he can still disapprove while in that position.